If you're a competitor in 4A on the girl's side, you can finally take a deep breath and know that Bailey Hertenstein has capped off her high school career, with her third straight State Championship. The Indiana commit was able to outkick Alyssa Hendrix of Riverview in the last 400 meters to claim the 4A State Championship. Former teammates Hertenstein and Hendrix battled the whole race until the end, when Hertenstein opened up her stride and was able to break the course record, which she set in 2015, in a time of 17:26.61. Not to take away any from Hertenstein's fabulous win, but former teammate Alyssa Hendrix, who is only a sophomore, finished just a few seconds behind Hertenstein, as she took the runner-up in a time of 17:30.82. Hendrix was the only girl to dethrone Hertenstein's perfect season at the Hillsborough County Championships. On the team side, Hertenstein's first place finish wasn't enough to catapult Newsome High over the favorite Winter Park HS. 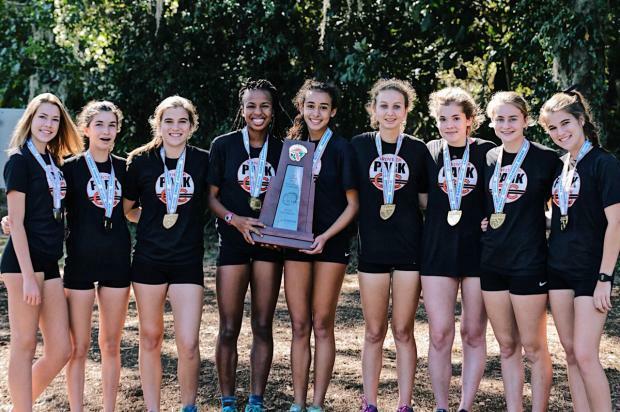 Winter Park collected their sixth 4A team title and they were led by NC State Signee Rafaella Gibbons, who finished fourth overall in a time of 18:22.56. Senior Melanie White also capped off an impressive senior campaign, as she finished 19th and was the key second scorer for the Winter Park ladies. As dominant as Coach Mac's girls have been, Newsome finished seven points short of the upset, but an impressive performance nonetheless. On the boy's side it was as wide open as all the experts had predicted it would be. With no dominant stud in the field, it was anyone's race to win and it was the junior from Sarasota HS, Benjamin Hartvigsen who left Columbus's Deshay Fernandes (15:43.99) to be crowned the 2017 FHSAA 4A Boys State champ. Hartvigsen, the 4A-Region 2 winner, overcame the crowded front pack and was able to steer himself to his first state championship, in a time of 15:39.70. As open as it was with the individual champion, it was as wide open for a team champ to be crowned. The top 11 schools in the 4A team championship had never won a state championship, so whoever broke through would be making history. What we thought would be a close race turned into a runaway for the boys of Oviedo HS. Led by the Trinity Prep transfers, Kayamo Galloway and Mamush Galloway who finished 11th and 29th and sandwiched between them was senior Tyson Harper who placed 23rd. The Oviedo boys won by 55 points to outpace the 4A Runner-Up, George Steinbrenner who were paced by junior Davis Bly, who placed 17th.